Let all the princesses know about a costume party in the invite. A "queen for the day" will need perfect princess party invitations to get her ladies-in-waiting to the celebration on time. Let everyone know the details by sending out invites that reflect the royal theme of the party. The type of princess party being hosted can help determine exactly what the party invitations will look like and how they are worded. Princess parties could be royal tea parties or even part of a little girls' slumber party. Consider the theme when choosing a party invitation. Princess Tea Party: Use bright pink, lavender and floral designs on pink teacups along with more formal wording. Princess Slumber Party: Find graphics featuring stick figures dressed as princesses and word the invite so everyone knows they are spending the night at the "castle". Queen for a Day: A throne or tiara-shaped card is the perfect way for a birthday girl to get the word out to her friends. Boy-Girl Princess Party: Include a knight on a horse or a prince figure on invitations that are going out to both genders. Costume Princess Party: Pick out an invitation that shows magnificent gowns and dresses; be sure to write on the invite that girls can come in costume or bring their favorite dress-up clothes with them. Character Princess Party: Little girls love the Disney Princesses and Barbie Princesses, so find invitations that reflect their favorite princess characters. When ordering invitation cards, check to be sure all information is correct. Most companies will not accept returns on printed personalized invitations when the customer makes a mistake. Save the kingdom's treasury by getting cheap invitations for the royal party. 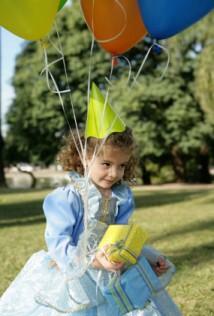 Save the gold coins for purchasing princess party games and favors. Announce the celebration using free party invitations. Buy cardstock, extra printer ink and find princess-themed free printable invitations to make on your home computer. Online invitations are great for sending to people that are connected to the Internet. Choose a princess-themed invite from services like Evite and Pingg. "Her Royal Highness Sarah Smith requests the honor of your presence. . ."
"The chariot will pick up Princess Elizabeth's ladies at the hour of one o'clock"
"Your presence is requested at the royal court when the trumpet sounds at high noon"
"Join Queen Alexis for tea and cakes in her royal banquet hall on Thursday, June 15"
"The Lords and Ladies of Anytown are invited to a royal costume ball hosted in honor of Princess Pam's fifth birthday"
Wording can be catchy and themed for just the front page of an invitation or it can be carried throughout the entire invitation or announcement. Any little girl who has dreamed of being a real-life princess will love a party where she can be one for a few hours. Princess party invitations that she helps pick out will only make the experience even better, as her friends get excited about the big day.